View of old Municipal Building located at Hamilton Avenue before December 1999 fire. 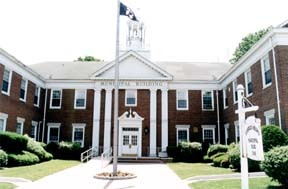 The information presented herewith is representative of the official minutes which may be obtained at the Boro Clerks Office during regular business hours. Not responsible for typographical errors. December 9, 2014 - Exec. Summary Min. September 4, 2007 - Spec. Budget Min. Photographs used herein are on loan and are not public domain. All rights reserved.